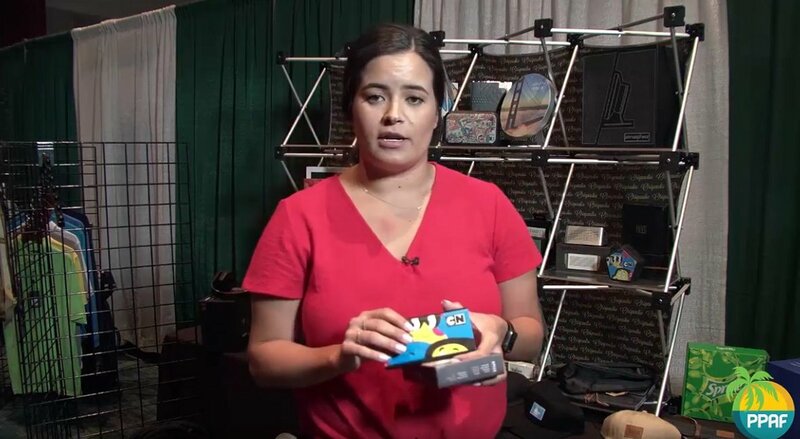 Part 2 of a 2 Part Series on Technology Swag and Corporate Gifts - One of the most popular items is the Flyington Selfie Drone. It is a selfie drone that fits in the palm of your hand. It has 4 little propellers on the top that pop up. And it takes HD video and stills from a small little camera in the front. It has about 5 minutes of flying time and a 150-foot range as well. All you need to do is just connect to the app on your cell phone and then use your phone to fly the drone around like a remote control. Our number one best seller hands down is the Boxanne Bluetooth Speaker. This is a great item because you have two sides to get your message out there. Your logo, design or full digital design is printed on an epoxy dome on one side and you can have more space on the grill as well. So you can do co-branding. Have one of your vendors sponsor this piece with their logo on one side and you put your logo on the other! Great to music festival give-aways, recognition awards conference gifts and more. The sound quality on this piece is fantastic and the price point is good. One of my Danielle’s personal favorites is the Tenfour. A 10400 mAh power bank. It has 2 USB ports, a micro USB and a USB-C with built in short circuit and surge protection. This powerful power bank can actually, if you have the USB-C and the USB-C cord, charge a laptop. You can charge up to 3 devices at once using this power bank as well. There is also massive imprint space for your logo or custom design for the ultimate branding opportunity. Then we’ve got the Octoforce. This is going to be your wireless charging alternative to the TenFour item. You can charge wirelessly on the top of the piece by just sitting your phone on the top. As a side note: wireless charging that’s iPhone 8 and up to use this charger. Otherwise you would need a wireless charging adaptable phone to use this item. There is also a USB port on the side. So you’ve got 8000 mAh power bank with dual functionality. This is going to be your best option. It won’t really matter what type of phone the recipient has, because even if they don’t have the ability to wirelessly charge, the USB plug will still let them use your gift. Next up are Budsies. CEShoppes personal favorites for gift giving. These are Budsies Bluetooth wired earbuds. You’ve got the 2 domes on the side where you can put your logo or message. Same as before. Either same logo / design on both pieces and a different design on each and in full digital color. These are actually wired together. You wrap them around your head and listen to music. They have a built-in microphone as well so you can talk on the phone. These are for those people who don’t like those ear buds that are not connected and are worried that they might fall out. They are wired together, but still work via Bluetooth. Then there is the Hive. This is the Bluetooth speaker. But what is so awesome about this one is you can use this as a standalone Bluetooth speaker or you can actually pair this with up to 100 different units! So the Hive will actually sync to 100 different hives. It creates a surround sound and can play any sort of music. We have people set them up all around their office and play different sorts of jams. There is also a nice place on the front grill for you full digital logo or message. We have another pair of Bluetooth headphones called the Beebop. These sit right on your ear. They have a large Digital imprint area on the dome. You can do the same artwork on each ear or you can do different artwork. The bebop comes in the awesome box. And last, but not the end of the full line, we’ve got the Onyt. This is an app enabled wireless smart button. This is very similar to the Amazon Dash, Echo button. It just syncs up to an app on your phone. You can program it to do a variety of different functions for you. Our owner Jason uses it to order Domino’s pizza. Sorry Jason. I called you out. It can turn all the lights in your house. You can order an Uber or a Starbucks. That is what Danielle likes to do with this button. Most importantly, the Onyt has a safety function so if you press the button down for 3 seconds it will send your GPS coordinates 10 different people in your phone. This is a great safety option for college campuses. For more information on any of these products visit CorporateGiftStores.com or call us at 888.249.0420.